This is the fifth book from Andrew Loomis that's reprinted by Titan Books. It's a well done reprint yet again. 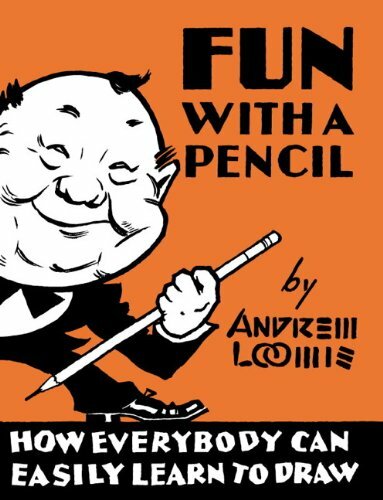 This book is more light-hearted compared to the other Andrew Loomis drawing books. It's almost like Figure Drawing for All It's Worth except you get to draw more cartoon-like characters. The figures have more caricature features, with more exaggerations. But the underlying drawing principles remain the same, such as the construction of the head and body. There are lots of examples. The main section is on drawing the head. The other lessons look at body proportions, poses, hands and feet, clothing, perspective, and lighting and shadow. Those lessons are short but do cover enough material for you to get started. I'll recommend it to beginners who are looking to draw more cartoon-like characters. If you want to draw more standard human figures, you should get Figure Drawing for All It's Worth.